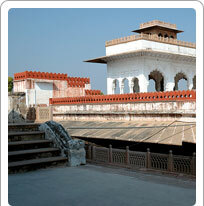 The museum of Bharatpur is inside the substantial Lohagarh Fort. Not only containing artefacts from the erstwhile Bharatpur princely state, it also has a rich archaeological collection from the nearby towns and villages like Noh, Mallah, Bareh and Bayana. The excavated objects range from the Kushan period in 1st century to the modern period in 19th century A.D.
Kachahari Kalan, meaning the court premises that was once the administrative block of the rulers of Bharatpur, was converted into a museum in 1944 AD. The personal chamber on the first floor (Kamra Khas) was also given for museum use later on. The diverse exhibits here include Weapons used by the Jat rulers, paintings, manuscripts, zoological specimen and local art & craft. The entire museum is divided into five sections according to the range of the exhibits. These are archaeology, arts, crafts & industry, armoury, children's gallery and miscellaneous objects. There is also an excellent Art Gallery housing miniature paintings made on leaves of the Peepal tree, mica and old lithographs besides the portraits of the Maharajas of Bharatpur. Guns and miniature cannons on display are unique. The miniature cannons are two sets of eleven cannons each, and were used by Maharaja Sawai Jawahar Singh in a battle while passing through the Jaipur territory on his return from a pilgrimage to Pushkar.